Ving making coffee in her Kuala Lumpur shop. Not being a coffee drinker, I nevertheless went on a quest for a good cup of coffee in Malaysia with my friend and Zheng Liren, a frequent contributor to The New Existentialists, because of his deep passion for everything related to coffee. Liren makes a point of visiting specialty coffee shops wherever he travels. He told us about how to roast beans, and how to go about brewing and tasting a good cup of coffee. As he talks, I’m reminded of the article Jason Dias wrote for these pages about being connoisseurs of pain. Liren definitely qualifies as a connoisseur of that bitter yet sweet liquid. He educates us about the finer points of bitterness. He taught me the language of the barista. I never knew that coffee could be sour and full-bodied. Tasting is believing! For all this, Liren’s reward is me showing up with a cup of coffee from McDonalds filled with cream sugar. No good act goes unpunished! Anyway, on a previous trip to Malaysia, Liren found a specialty coffee shop named Coffee Famille in Kuala Lumpur and he promised to take a companion and I along to revisit the shop and its owner. Liren also promised to brew his own cup of coffee with the owner’s permission. We arrived on a quiet Thursday evening and were granted with the owner’s undivided attention. Liren went ahead and brewed his own cup of coffee telling us about how a temperature difference of a few degrees will result in a different taste! He also demonstrated the patience required to achieve even pouring lest you overbrew one section of the beans in the filter. Such precision! I was in the presence of a connoisseur who took his art seriously! As we sat down to enjoy our cups of lovingly brewed coffee, we invited the owner, Ving, to join us to share her story about the opening of the coffee shop. Ving showed little hesitance as she recounted how she fell in love with coffee in her teenage years. She went on to tell us that she learned to become a barista from a specialty coffee shop in Taiwan during her university studies. 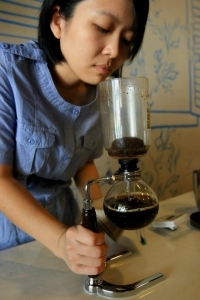 Naturally, I assumed that becoming a barista in Taiwan was a nice second degree she received from Taiwan. Ving reflected a puzzled look and corrected me by telling me that she specifically went to Taiwan to pursue her university degree in order to pursue training as a barista. In other words, the university degree was the means, with work experience at a specialty coffee shop being the end. Furthermore, she knew all along during her studies that she wanted to return to Malaysia and open a coffee shop of her own. Such dedication and clarity of purpose at a relatively young age! Yet, dreams are rarely realized without obstacles. Ving’s brother and mother were both strongly opposed to Ving’s decision to open a coffee shop. Part of the reason for their opposition was Ving’s business plan. Ving wanted to preserve the ambience of the coffee shops that she experienced in Taiwan. Despite better volume of foot traffic, Ving did not want to open up her shop in a mall. “Malls are not conducive for sitting down to enjoy a cup of good coffee.” A good cup of coffee requires time, and each cup of coffee must be individually brewed. The process cannot be rushed. All of this runs counter to the anonymity and standardized efficiency that characterize most of the coffee shops found in shopping malls. Furthermore, Ving’s brother was an accountant, and he was appalled to learn that Ving had no desire to expand her business. In fact, as Ving looked around her shop, she said that if she were to change or move, she’d move to a smaller shop to attempt to preserve the ambience that she wanted to achieve. The amazing thing, of course, is that despite the fact that her brother was opposed to her business plan, he gave Ving the start-up capital she needed to start the shop. Actions speak louder than words. I believe Ving’s brother invested because he could see Ving’s unshakable passion and knew that such passion must not be quenched. I visited Ving’s coffee shop during a five-day introductory workshop I was giving on Existential Psychology. I could not help but reflect upon how Ving’s approach to coffee and business parallels the existential approach to therapy. What Ving knows inherently in her soul is that there is also a soul and essence to coffee that must not be institutionalized or covered over. Each region produces its own flavor of coffee, and there are numerous coffee regions in the world. Typically, one only gets to sample coffee from a few regions in a franchised coffee shop. The specialty coffee shop owner knows intimately the coffees that he or she serves on her menu. The owner develops a close relationship with that coffee bean. Many roast their own beans, fresh, once a week, so they will not become stale and lose their flavor. And of course the beans must be ground fresh for each cup. Furthermore, there are various ways of brewing to achieve different tastes. It is anything but standardized and manualized. Like a good therapist, the true barista strives to bring the best out of each set of beans, and each cup of coffee is one step along that process. Ving makes sacrifices to preserve the soul of the coffee that she brews and serves, just as therapists and clients must strive to preserve the soul and essence of each of our clients lest their voice and individuality gets drowned out in cacophany of the masses. Finally, Ving shared the struggles she’s experienced and the grace that she’s received. An idealistic business plan will be severely challenged by the realities of the world. Ving admits to challenging financial struggles. Ving is the sole owner and has only a part-time paid assistant, who also bakes, to help her with the shop. Several times in the nascent life of her dream, Ving ran into problems with cash-flow. Anyone who has started their own business knows that problems with cash flow are ubiquitous with any start-ups. Ving shared with emotion how difficult those times were for her. She’s had to admit to her detractors that her plans were indeed flawed. She has endured the painful discovery of the limits and possible end of her dreams. Yet, Ving also shared that it was during such times that the miraculous took place. It was during both of these valleys that Ving received financial help from the unlikeliest of sources: her customers! One customer admired Ving’s clarity of purpose, tenacity, and courage in daring to pursue her dreams. Thus, he simply made an unsolicited interest-free loan to Ving with a two-year monthly repayment plan. In the other instance, another admirer decided to make a capital injection in exchange for part-ownership because Ving was living the dream that she was unable/unwilling to live. One can tell that these unsolicited acts of trust were overwhelming for Ving. They were completely unexpected and demonstrate the power of acceptance and unconditional positive regard. It is extraordinary to live under such grace. Liren, our companion, and I were all very moved listening to Ving’s beautiful story of survival and struggle. There was such beauty to her courage and pain. Her coffee shop is a living inspiration to the three of us.